Chinese Consul and Head of Post to Laoag Zhou Youbin paid a courtesy call to Imee R. Marcos, the honorable Governor of Ilocos Norte Province on February 2, 2018. The two exchanged views on developing bilateral relations and local government cooperation between China and the Province of Ilocos Norte. 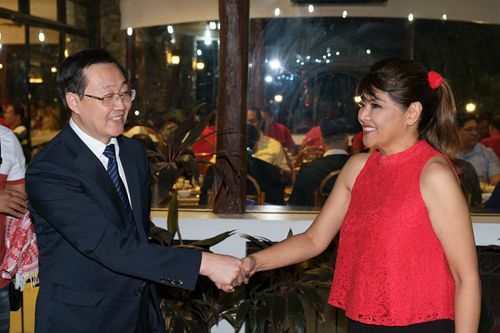 Governor Imee R. Marcos warmly welcomed Consul Zhou's assumption in Laoag and briefed about the history of communication between Ilocos Norte and China. She was willing to support Consul Zhou for his work and cooperate with him in expanding the friendly exchanges and promoting friendship of two countries. Consul Zhou expressed his gratitude to the Governor for her warm welcome, and pleasure to be appointed to Laoag during the historical period, when China- Philippines ties had been upgraded to the Comprehensive Strategic Cooperation Relations since the state visit of the Chinese President H.E. Xi Jinping to the Philippines last year. He appreciated the contribution of the Governor to the bilateral relations, and committed himself to cooperate with the Governor to enhance local level exchanges and cooperations.